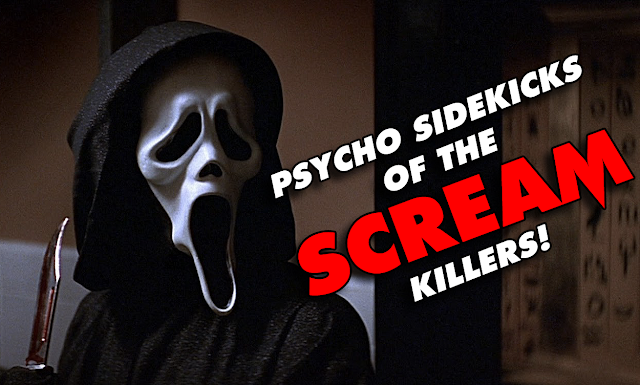 Psycho sidekicks of the SCREAM killers! Teen slasher movies are known for having crazy killers with even crazier motives for killing. But in 1996, Scream changed the game a little by adding a sidekick. It makes sense, really -- especially if a killer wants to avoid suspicion -- it's always nice to be able to be two places at once. And a sidekick can help out in that department. Since 1996, many slashers have gone on to utilize the two-killer angle, but something that sets the Scream series apart is that most of the time, the sidekick is a lot crazier than the mastermind. Ah, Stu, the loveable funny-guy. But, as we know from real life, it's usually the funny guy who is the most disturbed. And this holds true for Stu. The mastermind, Billy Loomis, was merely seeking revenge on his girlfriend, Sidney, because it was her mother who ruined his family. Something tells me it didn't take Billy a whole lot of convincing to get Stu to go along, though. The first attack of the movie is Casey Becker and her boyfriend, who we later find out that she dated Stu previously and broke his heart. Other than that, Stu really had no motive to kill anyone at all. Just a crazy psychotic teenager...who ends up, ultimately, just being Billy's patsy had it all worked out. It's never revealed, but I got the sense that Billy was never really going to let Stu see the sunrise. See the self-harm scene. Now things get interesting. Enter Mickey in 1997's Scream 2. The film takes place at Windsor College in Ohio, thousands of miles away from Woodsboro, California. Sidney and Randy appear to be trying to get as far away from Woodsboro as possible. But a ghost from Woodsboro's past has followed them: Billy's mother. Her motive is just a classic revenge story. But it's her sidekick who steals the show. She met Mickey online and got him into the game. To me, Mickey is the clearly the craziest killer of all four films. He has absolutely no connection to Woodsboro whatsoever and his ultimate end-game is fame. Had Mickey been the sole killer, he stood the best chance of getting away with it than any other killer in the series. Hell, was Mickey even his real name? Who knows. We also learn that the majority of the kills were by the hands of Mickey, something that sets him apart from Stu. Ultimately, like Stu, Mickey was also just a patsy...one who Mrs. Loomis quickly dismissed in the third act. Flash forward to 2011, back in Woodsboro. Two new killers set out on their own path on the anniversary of the original Casey Becker murder. The killers are revealed to be Jill, Sidney's teenage cousin, and Charlie. Charlie and Jill initially appear to have a secret love relationship as well as being homicidal partners. Jill's ultimate goal, like Mickey, is fame. But fame for a different reason. Charlie, though not the mastermind, seems to be the brains behind the operation. Jill basically let him call all the shots as long as the end was the same: Jill as the heroin (the new Sidney). But like all the sidekicks, Charlie is just a patsy...when Jill finally reveals that she plans on being the sole survivor. Poor Charlie. All that work for nothing. And it's clear there never was a real relationship there -- Jill just used Charlie. And there we have it: the psycho sidekicks of the Scream killers. Without them, there probably wouldn't be any theatrics to any of the murders. So hats off to you crazy patsies! Note: Scream 3 was omitted because there was only one killer (Roman).